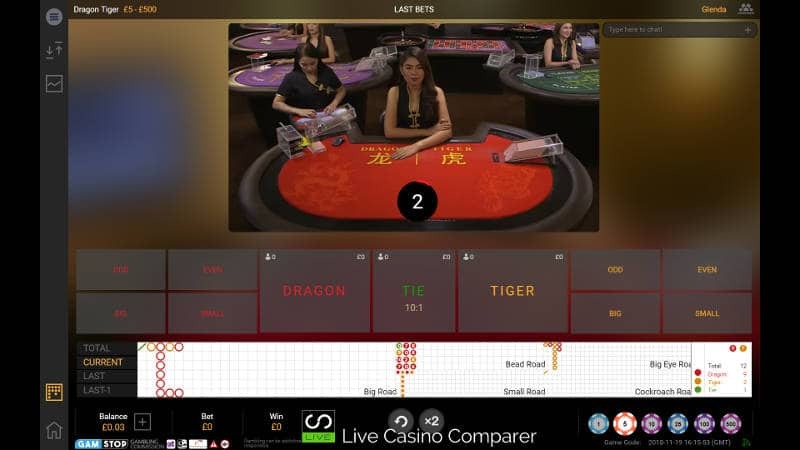 Playtech Live Dragon Tiger has to be the simplest and easiest of its live casino games to understand and play. It’s basically a coin flip game. You bet on which of the Dragon or Tiger positions will have the higher valued playing card. That’s it! 8 Decks of cards are shuffled and placed in a manual dealing shoe. You (the Player) place a bet on the Dragon or Tiger position on the table. The dealer deals one card to each position and reveals them at the same time. The position that has a card of the higher value wins. If the hand is a Tie, 50% of your initial bet is returned. There’s some basic rules you need to know about Playtech Live Dragon Tiger. Firstly Aces are low, counting only as one. Burn cards are taken at the beginning of each new shoe AND the start of each new game round. Tie Bets pay 10:1 – the competition (Evolution Gaming) pays 11:1 for Ties. Big – Bet on whether the winning number will be 8 or higher. Small – A bet on whether the winning number will be a 6 or lower. Odd – A bet where the wining number is odd, A,3,5,9,J or K.
Even – A bet where the winning number is a 2,4,6,8,10 or Q. All side bets lose if the winning number is a 7. All side bets pay even money 1:1. These are the best mobile live casinos with apps that I’ve come across. Baccarat, Roulette & Hi Lo. Good promotions and VIP care. Roadmaps are provided on the history of the shoe as it’s been dealt. They are exactly the same as the ones produced for Baccarat and are read in the same way. The full screen playing interface has a rather cluttered look to it when the Road maps are displayed. This hides about half the table from view, while it doesn’t obscure the cards everything does feel a bit cramped. The road maps themselves can be displayed in 4 formats, however the details is small so you might struggle to use them. Clicking on a road map expands it which makes it much easier to see. The mixed mode interface is normally reserved for players that have bad internet connections. I quite like to use this mode as you get the best of both worlds. It’s no so important for me to see the cards and on table play when playing Dragon Tiger. I’m more interested in seeing the roadmaps clearly and getting my bets down. The default settings for game play are normally good enough, but if you like to fiddle there’s a few configurable settings. Video quality can be set, with high giving the best. Low quality will select the mixed playing mode and is most suitable for those that have dodgy internet connections. Audio for game sounds and the dealers voice are optional. By default they are switched on. Access to your playing history and the cashier is just one click away from the menu. 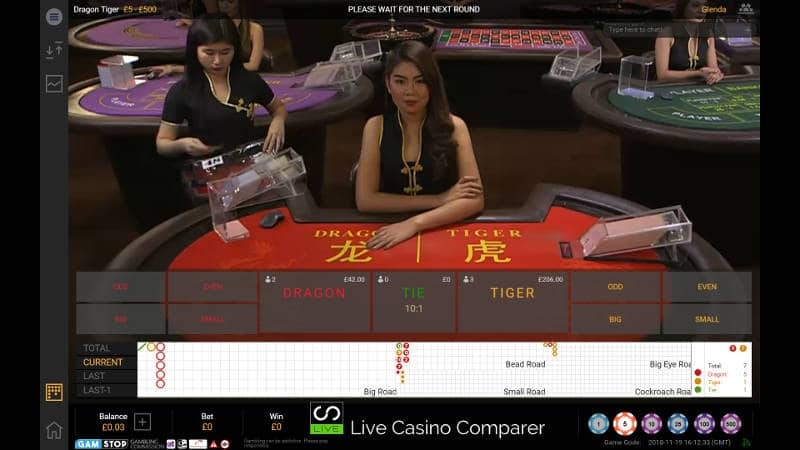 Playtech Live Dragon Tiger is streamed from the live casino studio in Manila, Philippines. The table itself is located in the middle of the studio, so you get a feeling of space and being involved in something much more than just this game. The game language is English. Of all Playtech studios I think the dealers here have the best accents, making it really easy to hear and understand them. Live Dragon Tiger can be a fun game to play. It sort of falls between Hi Lo and Baccarat in terms of what it offers. It’s a simple game, with easy to understand rules and betting options. This version by Playtech doesn’t have the best payout odds. The Tie Bet pays 10:1. You get better value playing Evolution Dragon Tiger, which has a payout of 11:1. Evolution’s other game, Top Card/Football Studio also pays 11:1 on Ties and is essentially the same as Dragon Tiger except Aces play High not Low.